I am so in the mood for post-apocalypse books right now, and Rivers worked well for me. It’s hard not to compare to Cormac McCarthy’s The Road, of course, and these books could be cousins as far as the devastating near-future setting goes, but they are different enough to be enjoyed without wishing you were reading the other. 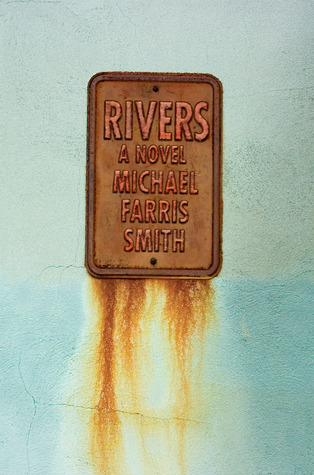 The aspect I liked best about Rivers was Smith’s detailed world building, especially for the crushing weather—constant rain, frequent hurricanes gaining strength one after another. The bleak, brutal wetness and cold is palpable in this book. Also, there was a lot more action in Rivers than I expected—impossible situations, violence, kill-or-be-killed stuff, which I found all appropriate to the desperate nature of this new world. A few things didn’t quite work for me, specifically that I didn’t feel like I really knew Cohen, despite being the protagonist and several flashbacks to his life before the storms (which had a tendency to be long sometimes, I’m not sure I cared so much). None of the characters were fleshed out much‚ Cohen is the only one whose past we learn about and I still didn’t feel like he was fully realized. I enjoyed it a lot though—this scenario of seemingly endless storms ravaging our country is a terrifying prospect and I thought it was imagined well here in Rivers. I’m sure I would have gotten through this faster if I didn’t feel a pinch by a few library books that were coming up due and other life stuff in general. Rivers is my second of twelve books read for my Ebook Challenge. Read from February 17 to March 14, 2015. This entry was posted in activities, books and tagged adventure, fiction, post-apocalyptic, science fiction, weather by kristin @ my little heart melodies. Bookmark the permalink. I’m a fan of post-apocalyptic novels myself, so I like the sound of this. Plus, the cover is excellent! I know! The cover is one thing that attracted me, as well as Shannon’s review at River City Reading.